This month marks 150 years since the last public hanging in London (and, indeed, in Britain). It took place outside Newgate Prison and involved a Fenian (Irish nationalist) bomber named Michael Barrett. Barrett had been arrested following the bombing of the Clerkenwell House of Detention in 1867 which, in a botched effort to free another Fenian, Richard O’Sullivan Burke, a number of bystanders were killed. Barrett’s case was a controversial one (he was the only one of six people to stand trial for the crime who was convicted) and his execution apparently postponed twice because of questions over his guilt. The crowd at the hanging on the morning of 26th May, 1868, was said to be large – a “great surging mass” (indeed, such was the interest that seats in nearby houses were said to have sold for £10) – but described in The Times as “unusually orderly”. “With the first sound of the bells came a great hungry roar from the crowd outside, and a loud, continued shout of ‘Hats off’, till the whole dense, bareheaded mass stood white and ghastly-looking in the morning sun, and the pressure on the barriers increased so that the girls and women in the front ranks began to scream and struggle to get free,” the newspaper reported. The hanging was carried out by William Calcraft, the orphaned son of an Essex farmer who many years earlier had found what was to be an almost life-long calling when, apparently while selling pies at a hanging he was noticed by his predecessor in the job and became his apprentice before taking in the job himself in 1829. Calcraft, who was known for his use of controversial ‘short drops’ which meant the condemned would slowly strangle to death rather than have their necks broken, was to preside over the last public hanging – of Barrett – as well as the first private hanging inside Newgate – of 18-year-old murderer Alexander Mackay in September, 1868 – before eventually retiring in 1874 and dying shortly after. Barrett, meanwhile, was buried under the ‘Birdcage Walk’ (also known as ‘Dead Man’s Walk’), the stone corridor which linked the prison with the Old Bailey. His body was transferred to the City of London Cemetery in 1903 as Newgate was demolished. The grave is marked with a plaque commemorating his place in history. Public hangings were banned just three days after Barrett died when Parliament passed the Capital Punishment Amendment Act of 1868. 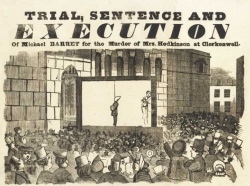 PICTURE: Image from an “execution broadside” of Barrett’s hanging in 1868. These were commonly sold at public executions in the 18th and 19th centuries. Capital punishment is disgusting, but public hanging is even more disgusting. Were they thinking of public hanging as a warning? entertainment? No wonder Parliament brought in new legislation, but what a shame it was 3 days AFTER Barrett died and not 3 days before.